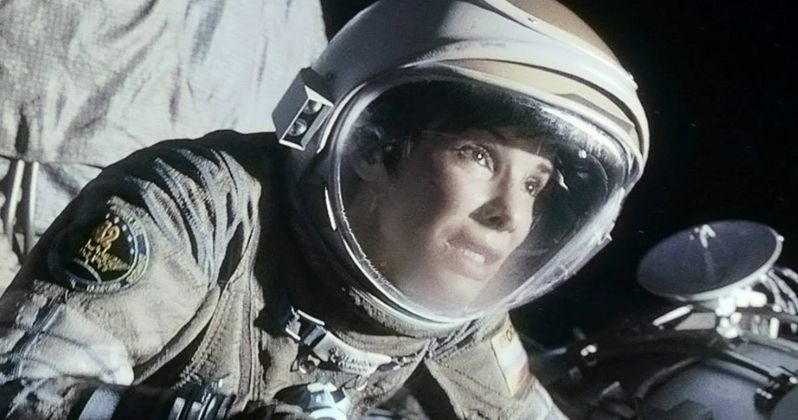 Following its 10 Academy Award nominations earlier today, IMAX and Warner Bros. announced that the hit sci-fi thriller Gravity will be re-released in IMAX 3D theaters nationwide on January 31. The film is already slated for a second run in over 900 conventional theaters starting tomorrow, January 17. In addition, Warner Bros. has provided us with new photos featuring stars Sandra Bullock and George Clooney. Take a look at these images, then check out the official press release with more details on the re-release. IMAX Corporation and Warner Bros. Pictures, a division of Time Warner Inc., today announced that Alfonso Cuarón's Gravity, one of the most popular films ever offered in IMAX 3D, will be returning to domestic IMAX theatres starting Jan. 31. Cuarón's spectacular sci-fi thriller, which stars Sandra Bullock and George Clooney, has been a hit with audiences and critics alike, grossing nearly $700 million at the global box office, while receiving 10 Academy Award nominations including Best Picture. Demand for the film - which was also nominated for four Golden Globes, with Cuarón winning Best Director - has been particularly high in IMAX 3D. Opening Oct. 4, Gravity was the highest-grossing IMAX release of 2013, both domestically and globally. It's also the 3rd most popular IMAX DMR film of all time worldwide. Here's what Greg Foster, CEO of IMAX Entertainment and Senior Executive Vice President, IMAX Corp., had to say in a statement. "Congratulations to Alfonso, David Heyman and Warner Bros. on today's Academy Award nominations. We're delighted with the overwhelming success of Gravity and the continued demand we're seeing from moviegoers, both domestically and around the world, to bring it back in IMAX. Word of mouth has been tremendous, with fans and critics demanding that Gravity must be experienced in the most immersive way possible. The film's ample awards consideration has further cemented its place in cinema history, and we're thrilled to be able to offer it again."